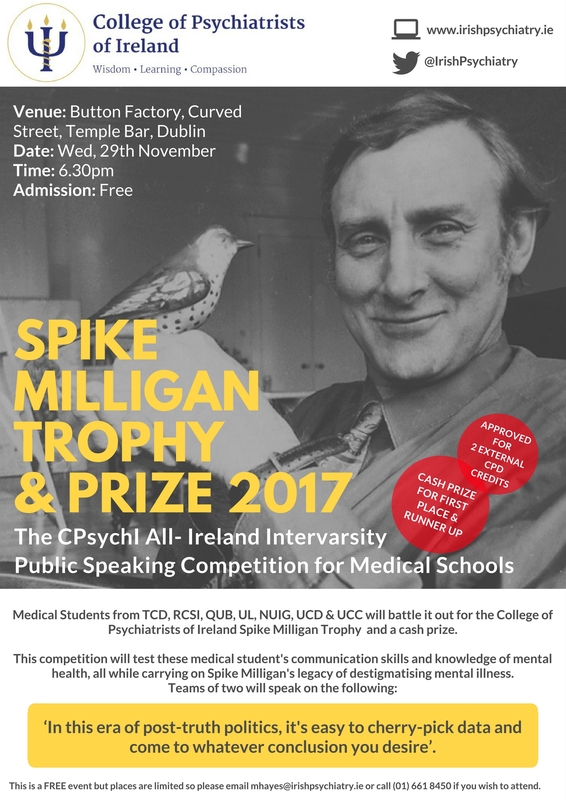 The College of Psychiatrists of Ireland’s annual Spike Milligan Public Speaking Competition is taking place on Wednesday 29th of November at 6.30pm in the Button Factory in Dublin. This Public Speaking Competition was first held in 1999 as part of the Changing Minds Campaign of the College, addressing the stigma associated with mental health problems. Spike Milligan generously lent his name to the competition. It honours his great work as an advocate for those affected by mental ill health. The aim of the competition is to foster and promote communication skills among doctors in training; with a focus on mental health. It is also an opportunity for public outreach and engagement on matters concerning mental health issues. ‘In this era of post-truth politics, it’s easy to cherry-pick data and come to whatever conclusion you desire’. Click below to download the printable poster.